The perfect tailgating item to add to your gift basket! 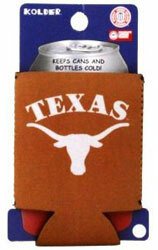 Kolder neoprene Texas Longhorns can holder with full glued-in bottom. Keeps drinks cold!